Desktop as a Service (DaaS) is seeing a huge growth in popularity due to growing demand for mobile working and BYOD. But, with the complexity and scale of solutions varying massively how will DaaS take off over the coming years and what does the future hold for it? 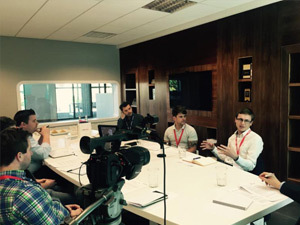 At a recent DaaS round table at UKFast Campus we asked the experts for the business benefits. Lowri has the lowdown. Mark Shotton, managing director at Datesand, believes Desktop as a Service is a game changer in the business world. Chris Miller, quality operations manager at Datesand, agrees. Roy Hibbert, business development manager at Citrix, believes businesses do not know enough about Desktop as a Service to reap the benefits. Cisco’s James Carty believes DaaS acts as a differentiator for customers. DaaS is one flavour of cloud-hosted desktops – download our whitepaper for more insights on which is right for you and the benefits of using a cloud-hosted desktop!